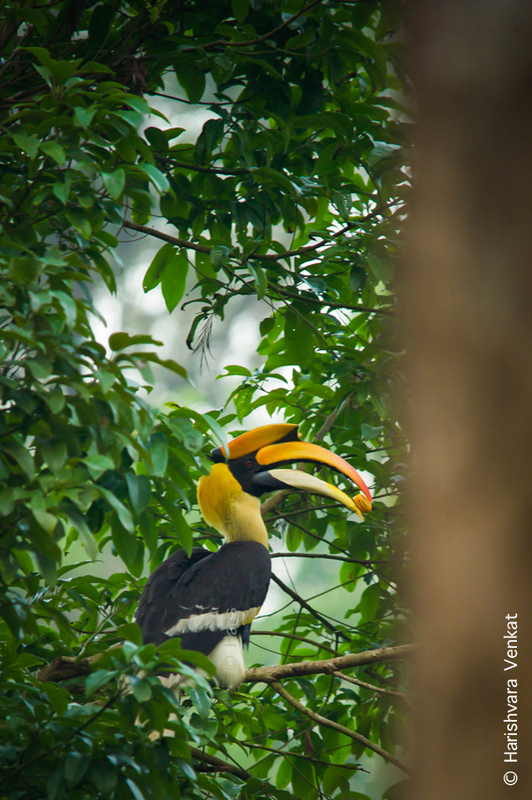 A photo essay of the beautiful landscapes, forest, birds and animals of Valparai. 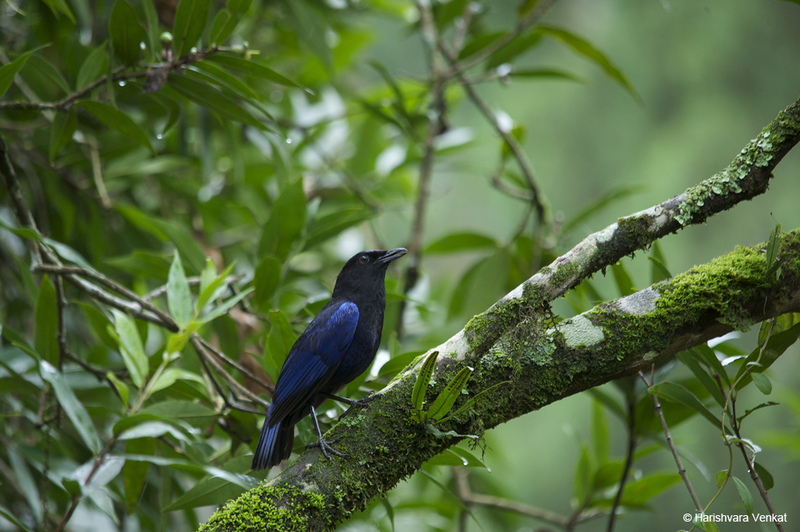 Probably the most common bird calls that anyone can recognize is that of the Malabar Whistling Thrush’s (Myophonus horsfieldii). Colloquially called the Whistling School Boy, these are found through out Valparai. Great Pied Hornbill (Buceros bicornis) a large bird with a fascinating character. 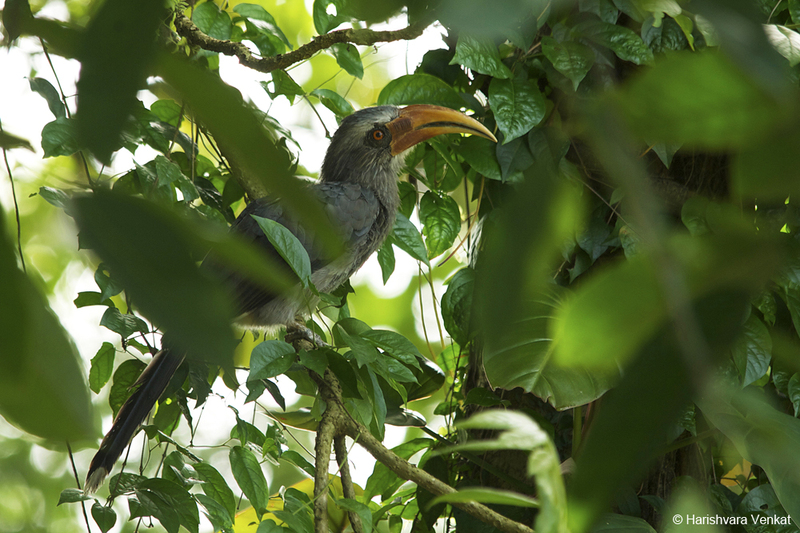 Malabar Grey Hornbill (Ocyceros griseus) a Western Ghat endemic is also found in good numbers in Valparai. With it’s distinctive chuckling calls its easy to identify them. 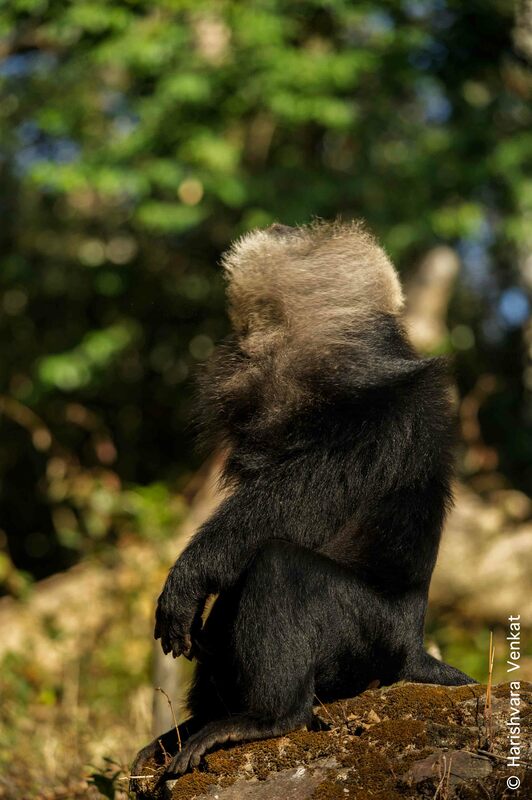 Nilgiri Langur (Trachypithecus johnii) is a Western Ghat endemic and shares the rainforest canopies with the Lion Tailed Macaques. Unlike the LTMs, these monkeys purely survive on Leaves. 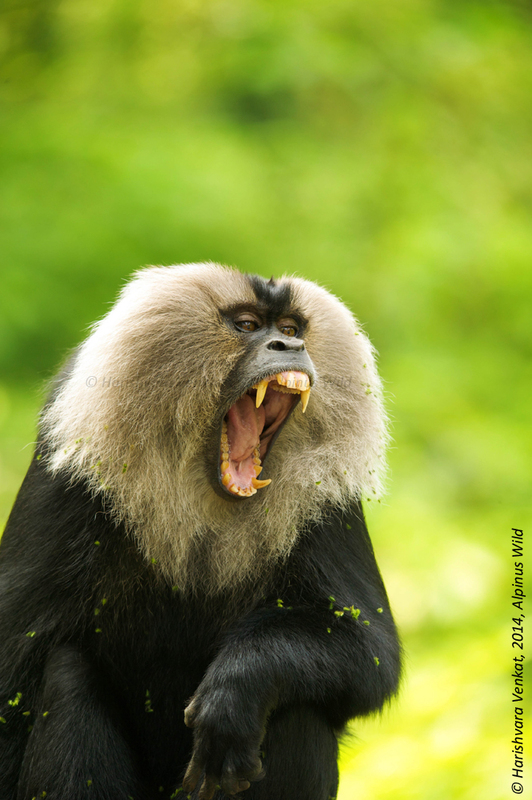 Lion Tailed Macaque (Macaca silenus), another primate endemic to the Western Ghats. 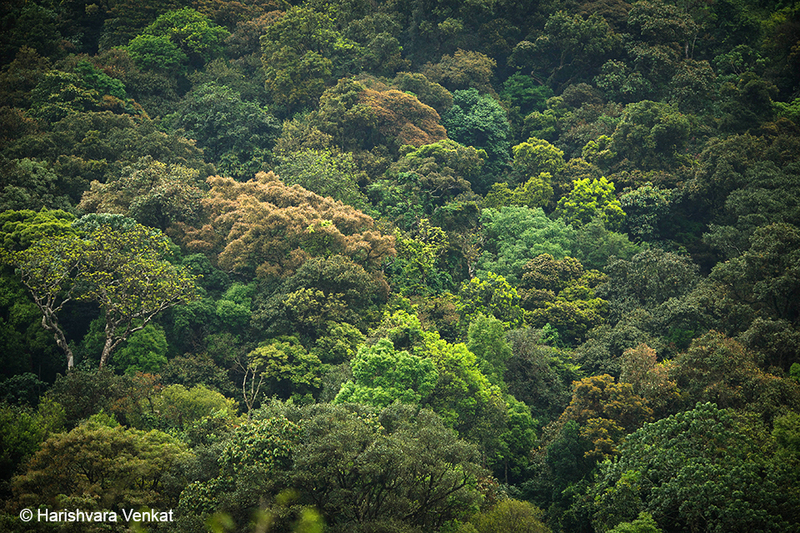 The last 3500-400 individuals roam in Valparai and in fragmented rainforest in Karnataka. 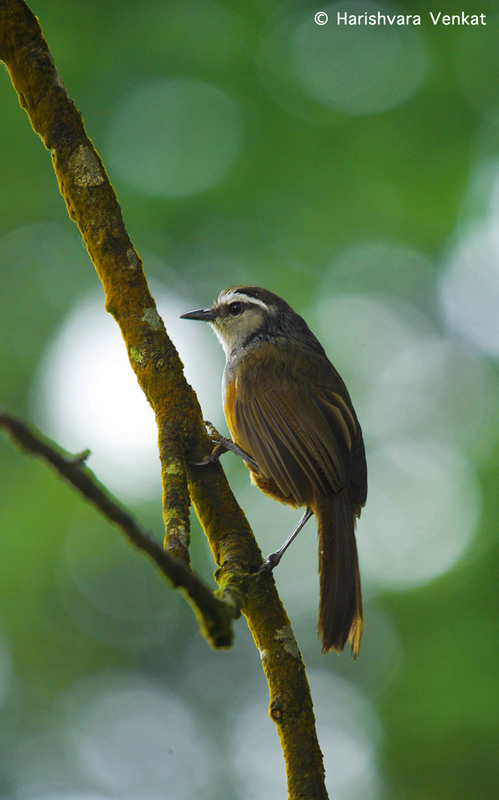 A few are also found in the South Eastern part of Western Ghats in Meghamalai Wildlife Sanctuary. 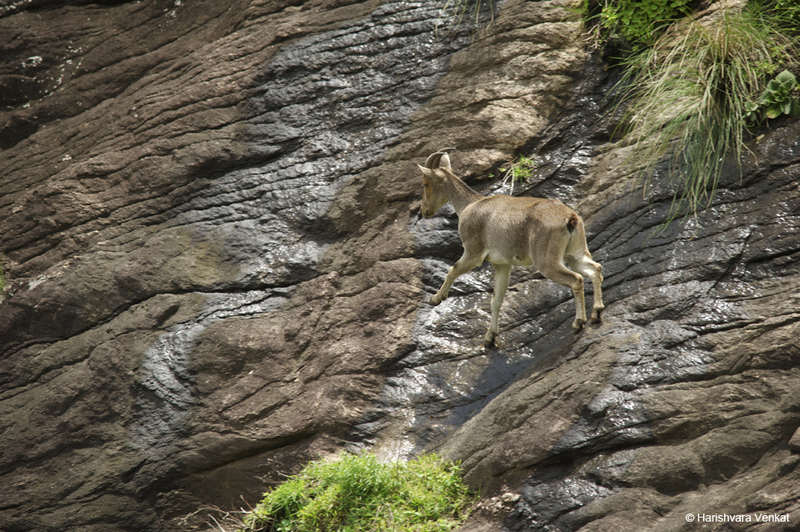 Nilgiri Tahr (Nilgiritragus hylocrius). 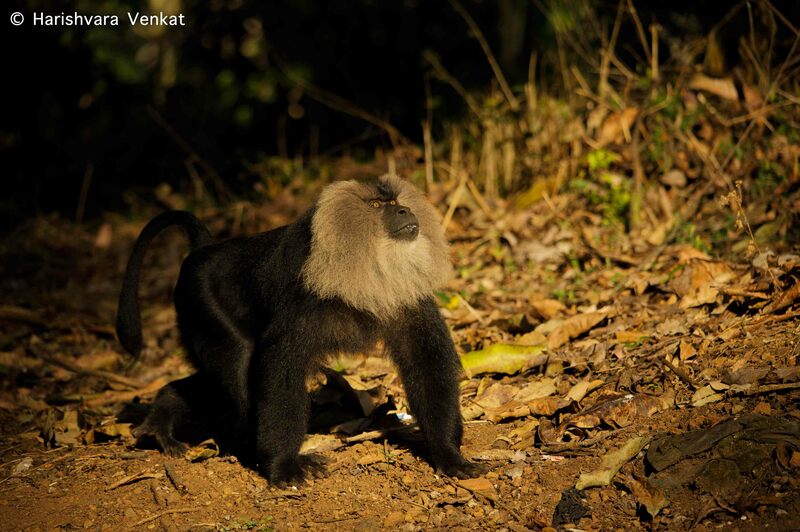 The State animal of Tamilnadu and Endemic to the Southern Western Ghats. 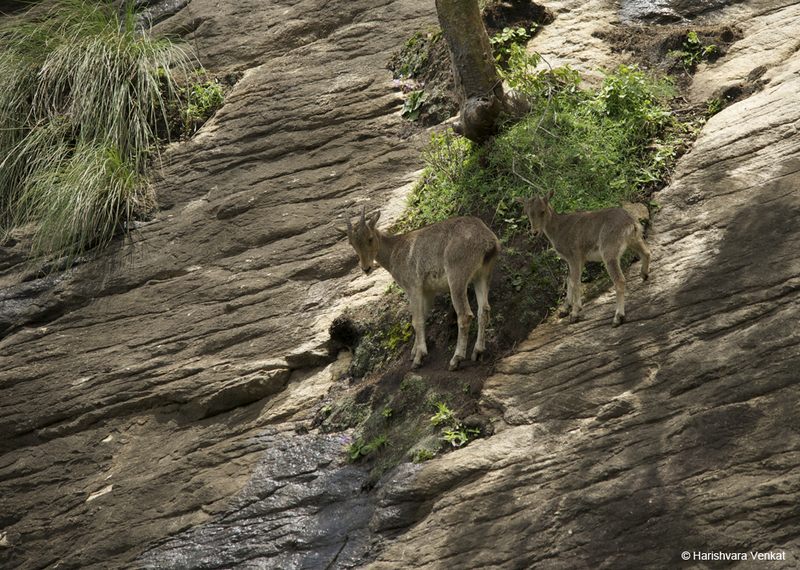 Nilgiri Tahr with its young resting in the shade. 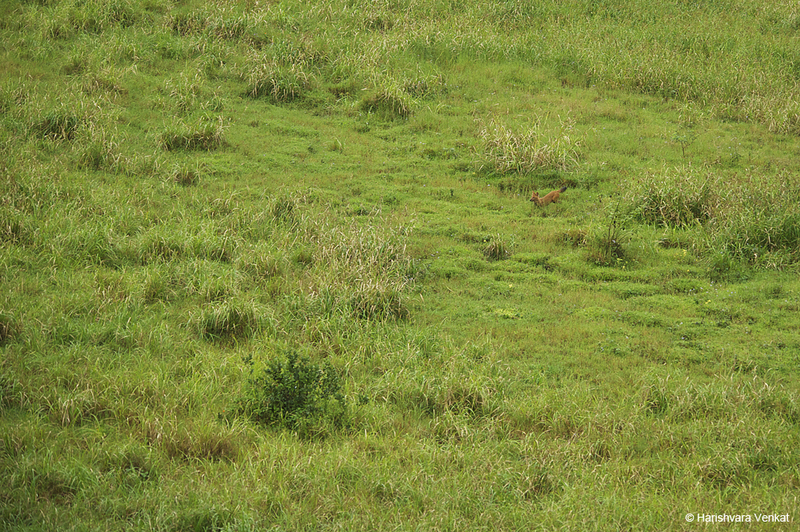 Dholes or Asiatic Wild Dogs are top notch predators. 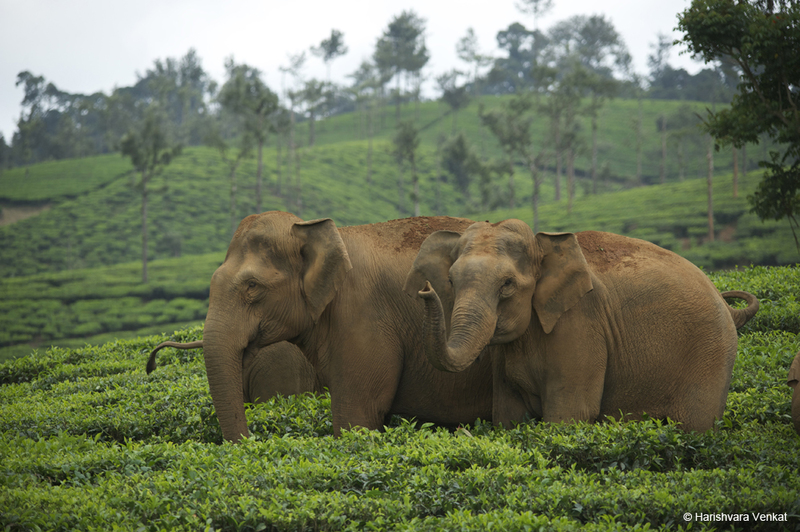 Using their small size to their advantage they navigate between the tea plantation in search of prey. Elliot’s Shieldtail a non-venomous snake. Some time in 2013, October if I remember well, I had taken my Uncle on a wildlife trip to Mudumalai. He was visiting India for only 6 days and was on a tight schedule. While he got back from Kodaikanal to Coimbatore with my cousin, I was getting back to Coimbatore from a holiday in Kovalam. After an 8 hour drive from Kerala, I met my Uncle at my cousin’s house and we started our drive to Mudumalai. 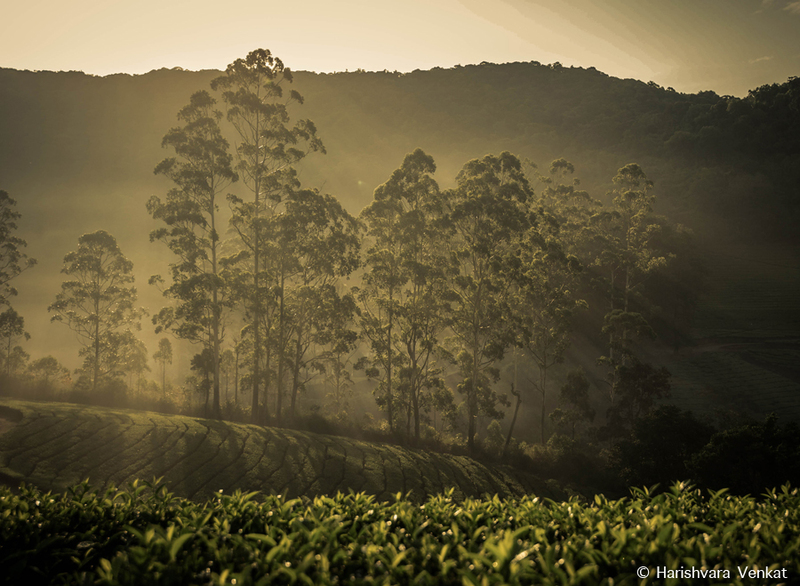 We woke up late the next morning and went for a drive towards Thepakkadu and Bandipur. We managed to see the usual wildlife on the main road with no luck with big cats or Sloth Bear, got back to the resort for lunch and a siesta. Later that evening, we went for a drive towards Singara Road and Moyar Road. This one time, probably the first time, I decided not to take my tele-photo lens with me and carried only my Nikon AF-S 16-35mm f/4 ED VR Wide Angle lens with the D3s. I made up my mind that if I spotted any animal, be it a Tiger or a Leopard, far or near, I am not going to regret the fact that I left my tele-photo lens behind and make best use of the ultra wide angle lens I voluntarily decided to take along. As luck would have it, we did not spot any tiger or leopard. But we came across a Bull Elephant, standing on a game track about 8 to 10 meters off the road. Being used to looking at wildlife through the view finder, especially with a tele-photo lens, the experience viewing with an ultra wide angle lens was very different. I was liking it, in fact loving it. At 16mm on a full frame camera, I saw a bit of tarmac, the game track, the lantana and cacti in front of the elephant, the elephant itself and the cloud filled Nilgiris behind the pachyderm. 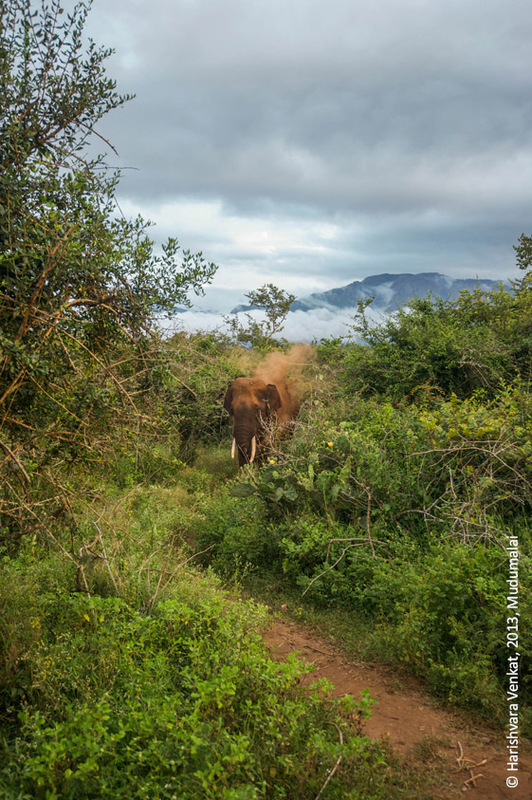 Suddenly there was so much going on in the frame with the clouds moving and the elephant dusting itself off with mud. From the body language of the elephant I could tell he was not in a good mood, so before making him lose his temper I wanted to make a few images and leave. I was mighty happy with the results. 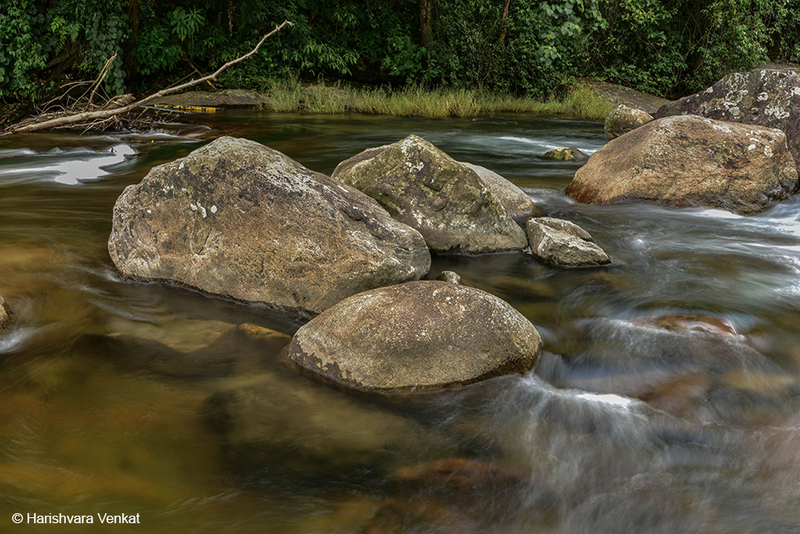 That’s when I decided I am going to carry the wide angle lens with me and look for interesting perspectives every time I step into the jungle. Ever since, I have had the opportunity to get up close to some animals a few times and shoot with my Wide Angle lens to get alternative perspective of the animal. 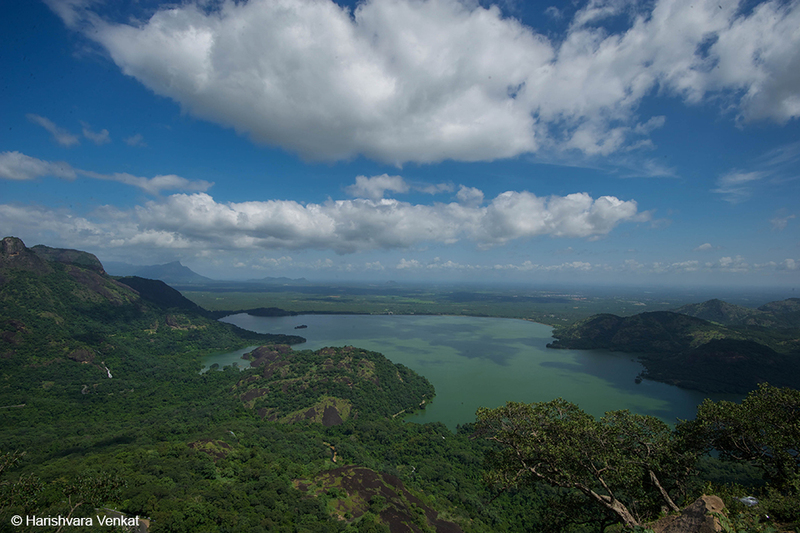 The second opportunity came up about 4 months after my visit to Mudumalai with my Uncle. This time, it was a known elephant. I have seen this elephant for years now and spent a good amount of time watching him and photographing him in the past. The sighting was close to Sigur bridge on a friend’s farmland. Since this elephant was used to my presence, I took the liberty to walk up to him very slowly, of course after reading his body language and took cover behind a tree about 15-20 feet from him. He stopped feeding for a minute and was noticing what I was up to. After realizing that I was up to nothing but making noises with my camera, he went back to gracing. I seized the moment with this capture and was fortunate enough to get another personal favorite image. 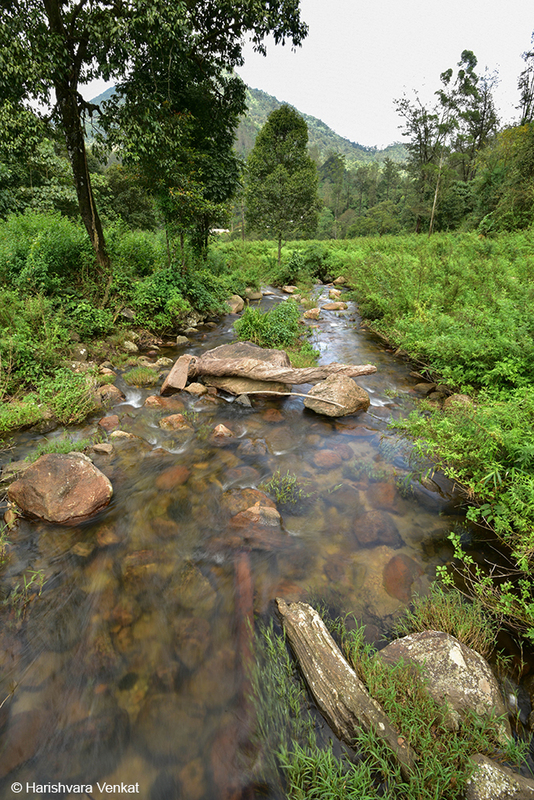 As a professional photographer I frequently drive up to Valparai on work. 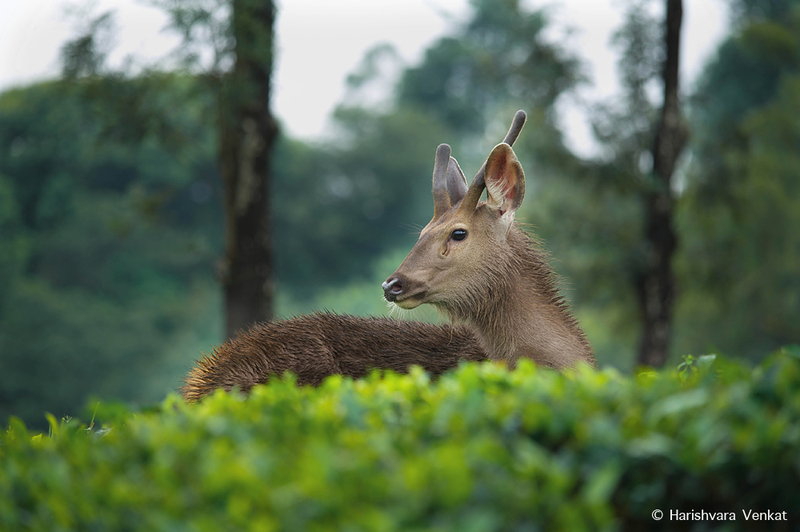 The best part about working in Valparai is that I get to shoot wildlife while I am at work. On one such trip I had the opportunity to photograph a Nilgiri Tahr up close. Rather than me going to the animal, I was waiting for the goat to walk towards my car so that he knew I was not intruding his space. It took about 5-10 minutes but that’s beauty of it. I have learned, the more you wait, the better photographs you will be able to make in the process. Unfortunately everything revolves around the clock these days and everyone is in a hurry to get things done. But ultimately, shooting wildlife is not about rushing up. Of course, the waiting has to be backed with a fair amount of knowledge of the subject, otherwise one would end up waiting for nothing. 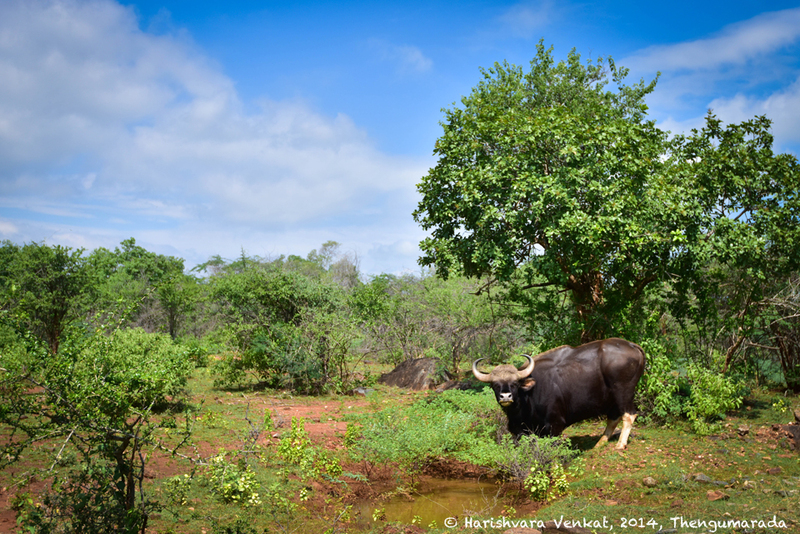 An Indian Gaur we encountered on the way to Thengumarada shot at 35mm on the Nikon D810. 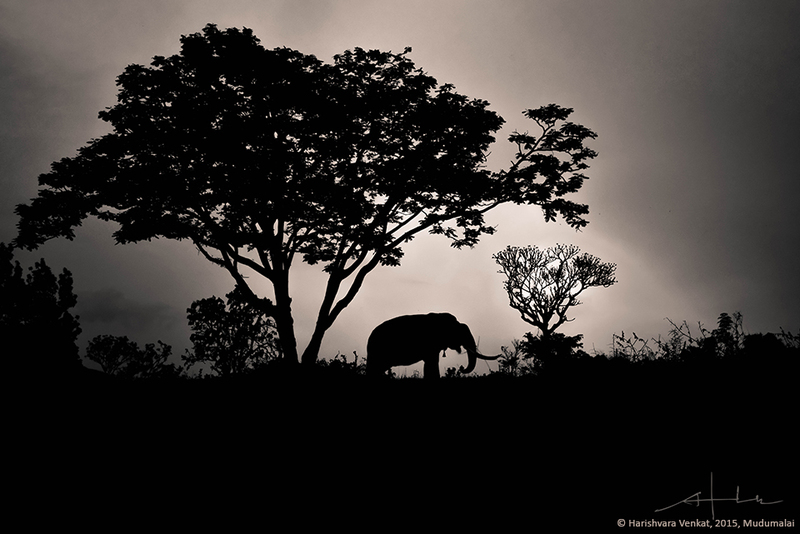 Finally, one of my favorite images of an elephant that I photographed last week. Even though it was not a wild elephant, we did not change anything from the scene. We did not position the animal there, we did not ask people to move away, we did not do anything other than treat it as a wild subject and photographed it like how we would photograph a wild elephant. The lighting was utterly brilliant that day and it couldn’t have gotten any better. 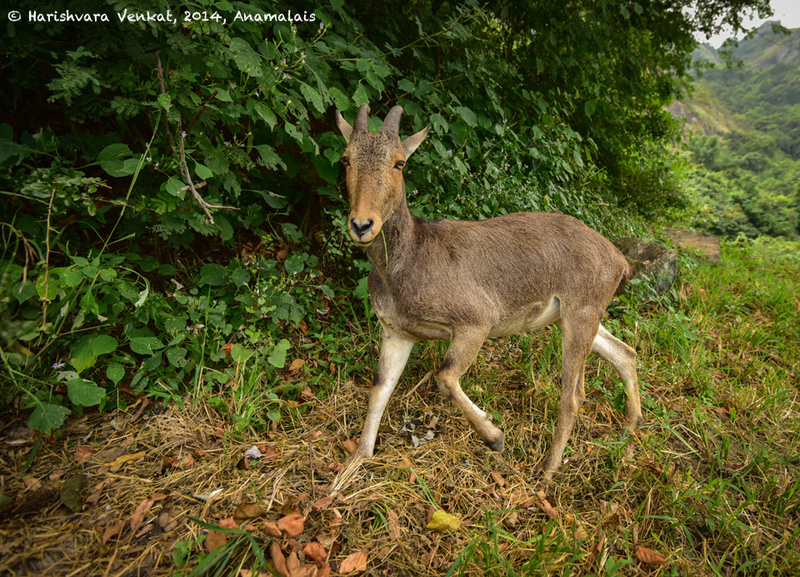 Conclusion: Wide Angle lens for photographing mammals is Epic! A lot of budding photographers today are under the misconception that wildlife photography is all about shooting with a telephoto lens. A telephoto lens is just an aid to shoot animals up close when you don’t have the opportunity get close to the animals. It is certainly not a mandatory equipment to have to pursue wildlife photography. Bird photography, though, is a different ball game all together. I have thoroughly enjoyed shooting mammals with an Ultra Wide Angle lens and I think a few of us should experiment with an alternative perspective when it comes to shooting wild animals. Hello everyone, I am back after a really long break. This time with a very different travelogue. Here I was, traveling to the ever beautiful Meghamalai yet again. But this time around, I had a different idea of a travelogue, a rather insignificant one at that! For someone with an acute sense of smell, I decided to put my sensory receptors to good use this time around and register every smell I encounter all the way long with the car windows down (hence a Nosy Traveller). Somewhere in between, we couldn’t take the heat of the day so we put up the windows briefly to turn the air conditioner ON. The route we took from Coimbatore to Meghamalai this time was through Munnar, as we had a shoot to be done at Briar Tea Bungalows’, Talayar Valley Bungalow. From Munnar we took the Kumily route to get to Chinnamanur and off we were to Meghamalai. It’s only after I reached the destination and took a look at the list I made did I realized how much fuel smoke and pollution we inhale everyday. The only realization that came out of this random sensory experiment is that, it’s a much better option traveling with your car windows up and air conditioner on. 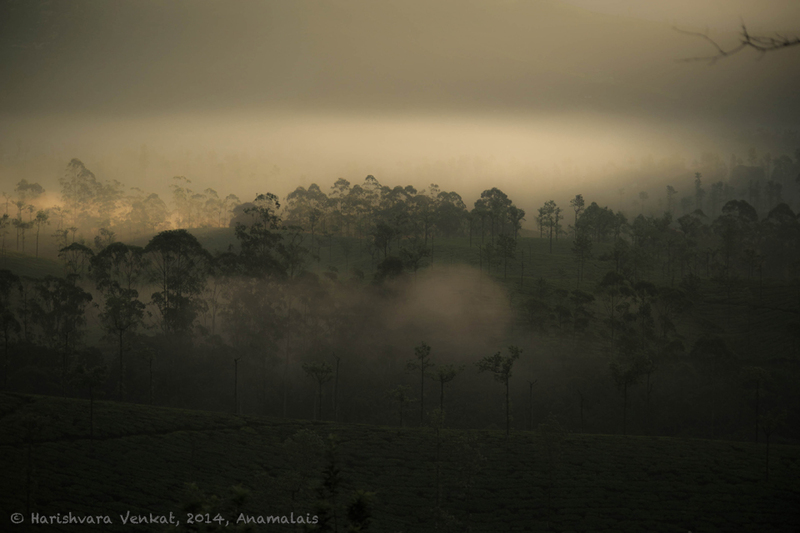 A Cloudy Paradise called Meghamalai! Meghamalai, a mountain range situated in Theni District, is a part of Western Ghats. I had to visit the misty mountains on an official trip. 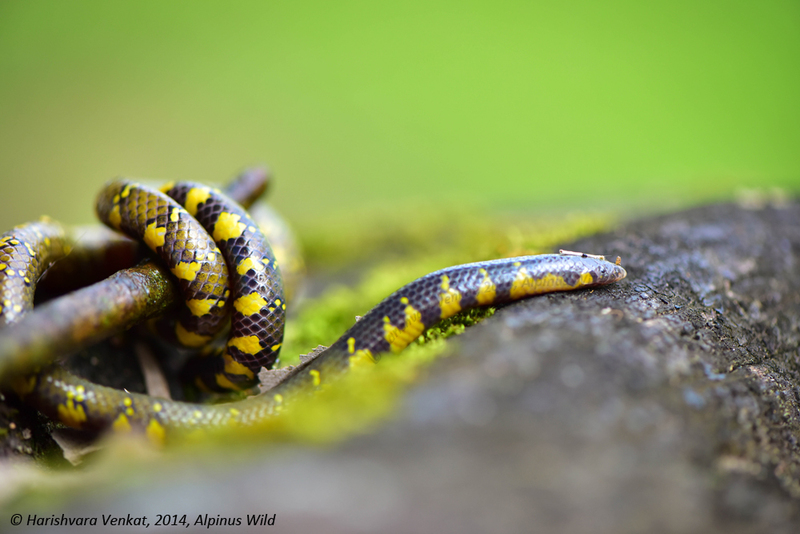 Being a commercial photographer- who embarked on a photography journey shooting wildlife- working anywhere close to the forest is an exciting trip for me. The nightmare however- I wasn’t going to drive. I was given my client’s company Bolero with a driver accompanied by the Hospitality Manager of the group. Being a very keen driver myself, I have done some crazy stretches, some times driving for 14 hours straight without taking a break. As much as I enjoy driving, I am terrified to be a passenger in a vehicle with a driver that I don’t know of! I comfortably ride with only a handful of drivers like my brother, cousins, and a few close friends. Having said that, I was going to be a passenger for 550 kilometers with an unknown driver, a vehicle that doesn’t handle well, unknown terrain, and a friendly co-passenger, Mr.Tharani Tharan. Although our driver was going slow, my eyes were constantly on the speedometer trying to have a check on the speed. I may sound weird, but this is sort of a phobia that I have! Another group of two gentlemen were supposed to join us on the trip and they were arriving from Cochin. Since they did not know the route, we were waiting for them at the Kollam-Theni / Kochi- Dhanushkodi intersection where we witnessed a spectacular scene. Six Auto Rickshaws, painted in funky colors, had sign boards all over them, luggage trussed up on specially designed roof racks, with some crazy drawings of Tigers, Chicken Curry etc, it was a sight like no other. All 6 Auto Rickshaws, had only 3 members each in them, the best part was all of them were foreigners. 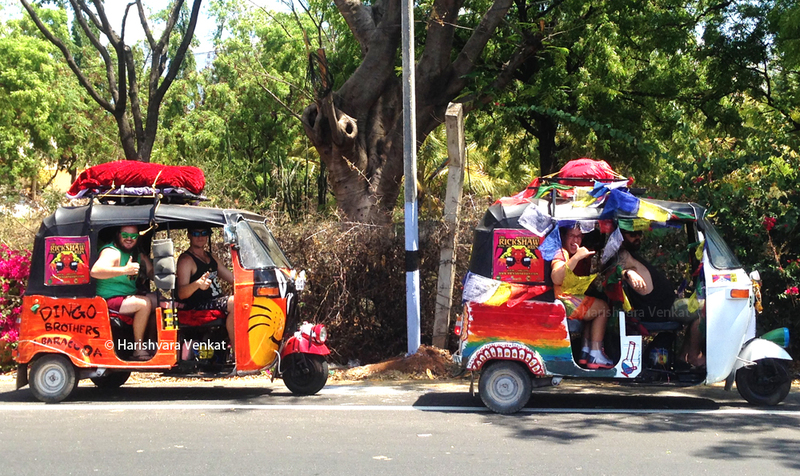 A bunch of white people, driving funky colored auto rickshaws, is not what you see every day in India. I had to walk up to them and with their permission take some pictures. From their accent, I could tell they were from the US. I couldn’t interact much with them since our friends from Cochin were about to reach any moment. It was a wonderful scene nevertheless. 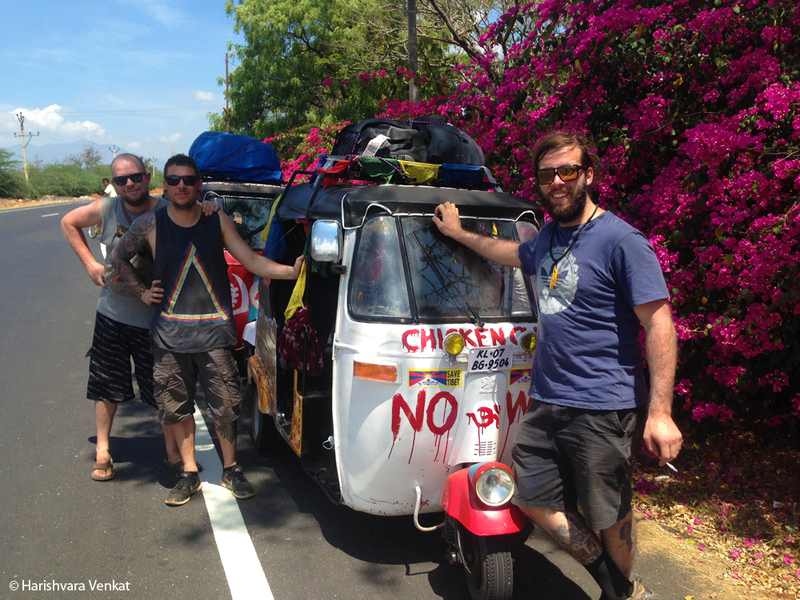 The Cochin duo, John Mathew and Biji Kurian arrived just after the rickshaw rockstars left. In two cars, we started proceeding towards Meghamalai. We had to stop over at a junction to park Biji’s 300 kilometer old VW Polo GT and shift them over to our Bolero because the roads to Meghamalai is in horrendous condition and no vehicles other than SUVs and Jeeps can go there without scraping a good portion of the car’s underbody. Finally after all the wheel locking, understeering, crank knocking, clutch burning we reached the main town of High Wavy Mountains. It was a very beautiful and scenic place with huge mountains, deep valleys, ever green forest carpet folding one on top of the other and a huge reservoir which was bone dry. About 20 minutes to our destination, Tharani got a call from the resort saying the lunch was ready and he also promptly warned us about elephants right in front of the bungalow. Like a boy was I excited! Hoping they wouldn’t wander off before we reached, I got busy being awestruck looking at the beautiful forest patches in between the Tea plantation. In no time, we had reached and before even getting my luggage and camera gear out, I asked the staff if they could take me to the elephants. Without wasting time, we walked towards where the elephants were and finally spotted them about 500 meters from our guesthouse. It was hardly a sight because they were behind a huge thicket busy feeding. Hungry ourselves, we headed back to the guesthouse for a hearty meal followed by a hot cup of home brewed tea. After the refreshing cup of tea, John Mathew, Biji and I went out for a walk with our camera hoping to take pictures of the elephants we saw an hour back. 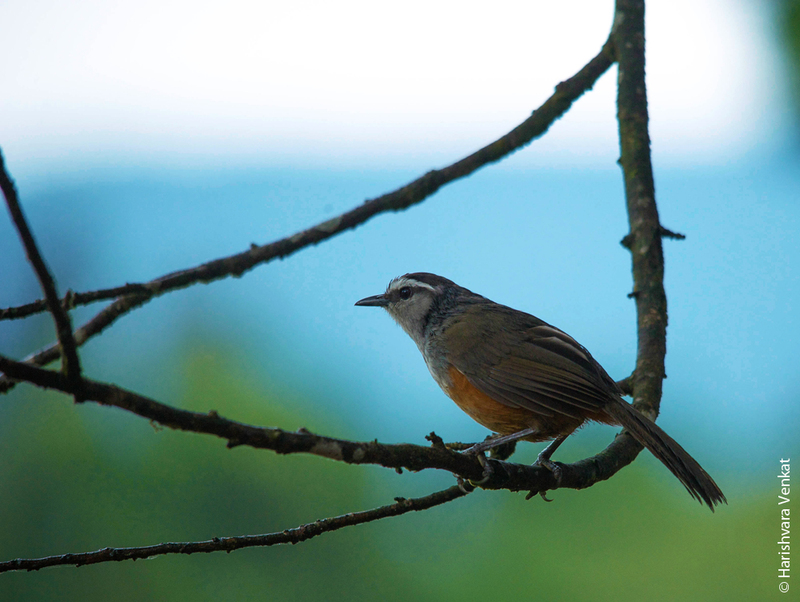 As we were walking down the service road, I was surprised to see Grey Breasted Laughingthrush / Kerala Laughingthrush (Trochalopteron fairbanki fairbanki) perched about 20 feet from us. As much as I was excited to see these “Near Threatened” species of birds, I did not want to scare them off. To my surprise they never flew away, like they were posing for my camera. John and Biji were very supportive being quiet spectators while I went trigger happy shooting these elusive birds. Few photos are attached below. 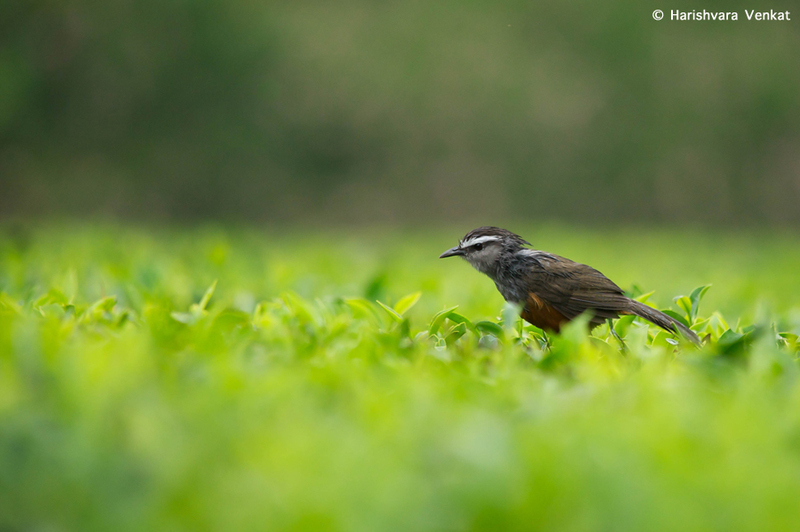 While I was shooting the bird, John Mathew called out to show me another of the same species perched on tea plantation. Moving in slowly trying not to freak them out, I went down on my knees to get an eye level shot of the bird. Only after looking through the view finder did I notice that the bird was wet by the rain. All in all, it was a great sight with great light. After the Laughingthrush episode, we settled down nearby to review the images, while one of the staff walked towards us saying the elephants were out in the open. We walked a few meters down the road and across the hill were 3 beautiful elephants crossing the forest land to get to the other side of the hill. The family of 3 was lead by a sub-adult bull, followed by a few months old calf trailed by the mother. Mid-way, they encountered a slippery patch of rock which they had to cross to get to the other side and for a while the sub-adult male was hesitant. Building up all the courage he went for it and the others started to follow right after. Almost 90% of the slippery patch was over and we witnessed something that was heartwarming. 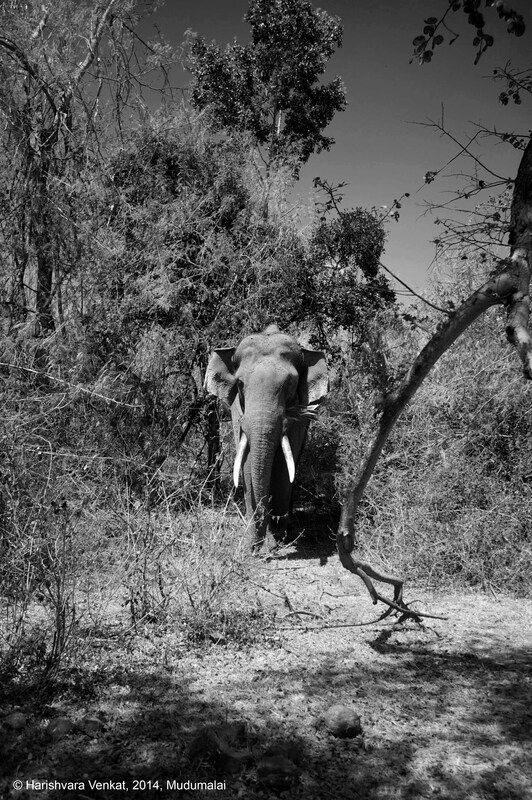 Right after the male elephant cleared the slippery patch and just about when he entered the thicket, he stopped. Leaving the baby and the mother waiting on the slippery rock. The baby was spooked! In a gesture of reassurance, the mother elephant immediately supported the calf with her trunk, holding her from slipping off in to a 50 meter fall. The male elephant immediately moved into the thicket as though they had a silent conversation about what was happening. This gesture by the mother elephant surprised all of us and I was glad I made an image of this scene. After this incident, strangers Biji, John and I became friends. Happily, we walked back to the guesthouse for another cup of hot tea and we endlessly started talking about wildlife and all our experiences. The following day, 3 of us went on a morning drive and the lighting was just spectacular. 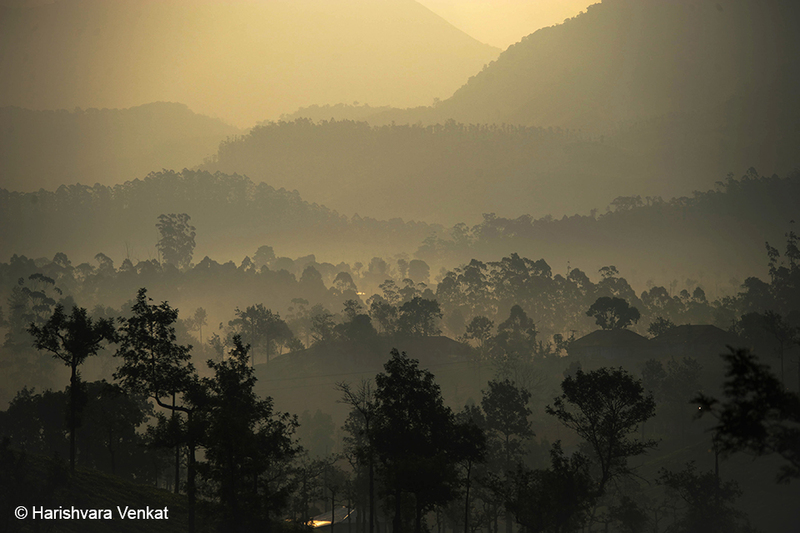 A whole new world opens up when the early morning sun meets the long staying mist. 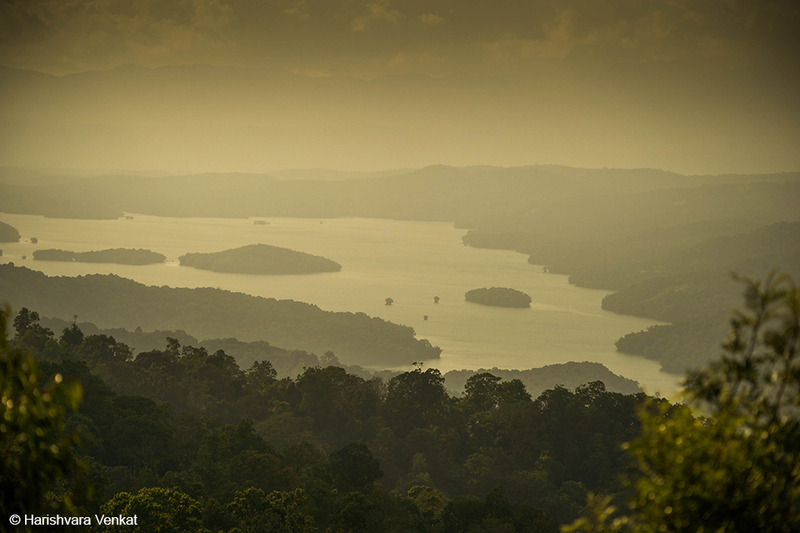 We took some landscape shots before heading back to the guesthouse, and here is one of the photographs. Our stay in Meghamalai was coming to an end and we were getting back with fond memories of the mountains, rain, birds, elephants, beautiful weather, Meghamalai (Cloud Mountain in Tamil) and of course the grueling ride. 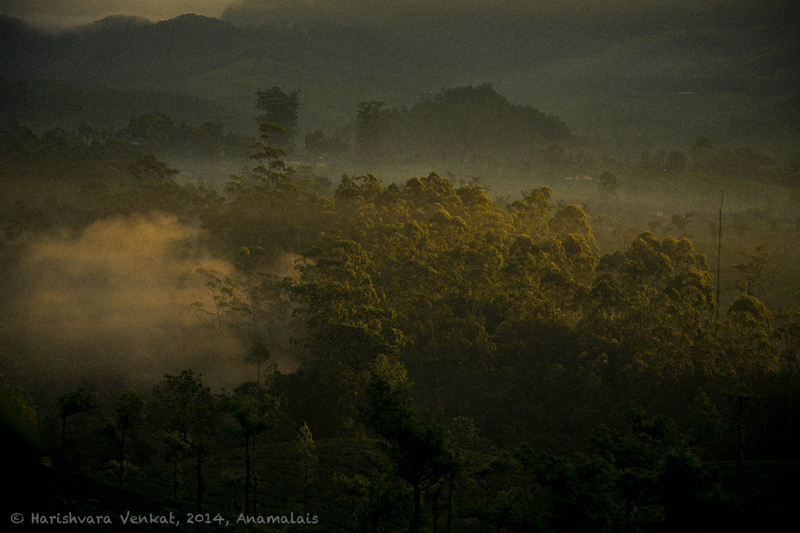 My job in Meghamalai is not over yet, gladly, and I cannot wait to go back during Monsoon. 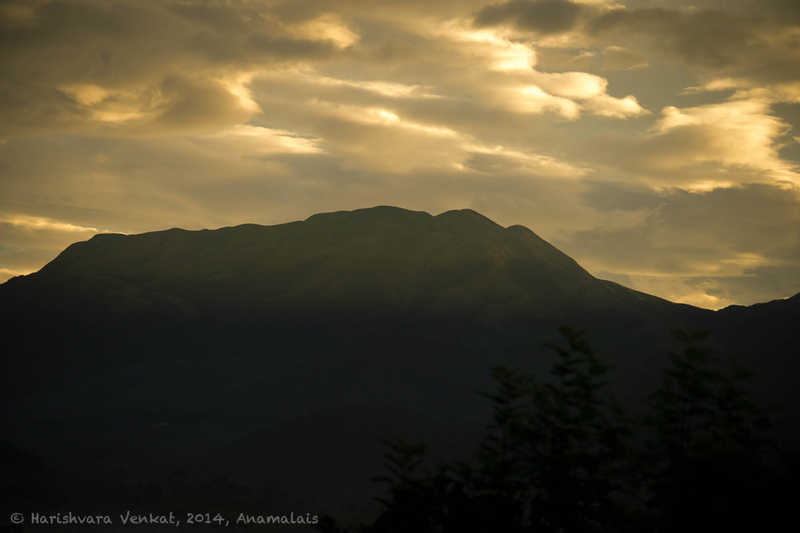 We were headed towards Valparai that day. I’ll probably save the stories from it for the next post. Valparai is a place that I have been visiting for the last 9 years. 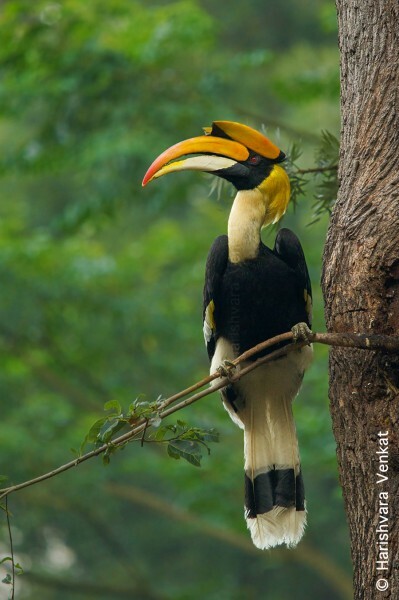 And every time I visit, the one photograph that I’ve always missed is that of the Great Pied Hornbill (Buceros bicornis). More than one thing fascinates me about this great bird, their sheer size, their vivid colors, the loud sound made by their flapping wings when they fly and their monogamous pairing. This time, I was lucky enough to get different photographs of both the male and the female bird. I have edited an image to bring the male and the female bird to one image with the intention of showing the basic difference in the sexes. 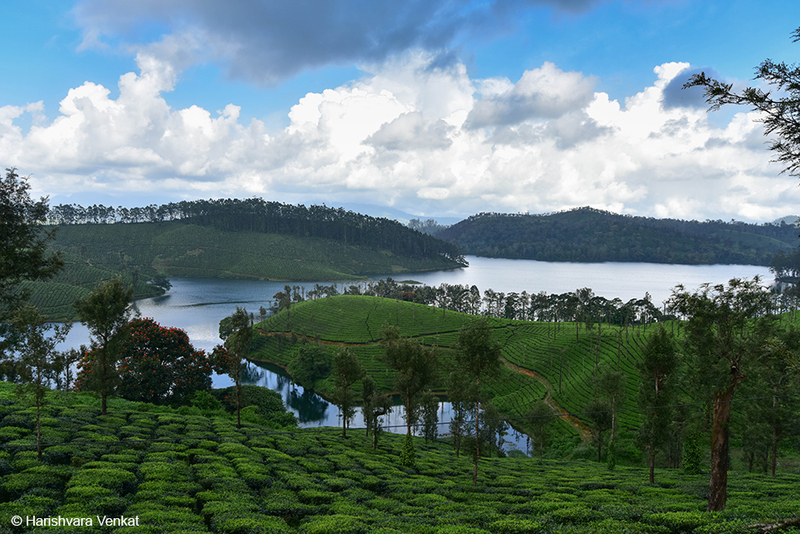 Taken at Valparai on the 10th of April, 2014. Left: Female, Right: Male. Females are smaller than males and have bluish-white instead of red eyes although the orbital skin is pinkish. 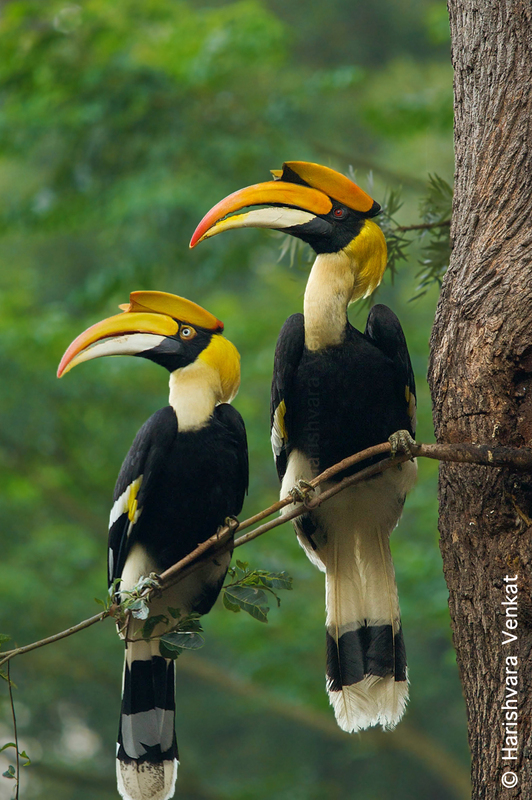 The most prominent feature of the hornbill is the bright yellow and black casque on top of the massive bill. The back of the casque is reddish in females while the underside of the front and back of the casque is black in males. The males have black marking on white tail and the females have white on black. Photograph of a Tiger finally! It’s only everyone’s dream to spot a wild Tiger in the jungle, and so is mine. After almost 25 years of watching out for wildlife in the forest and with not much luck with spotting tigers, I have other things in mind now, especially after getting into Birding. On the other hand, I have spotted close to 40 Leopards in the last decade, prior to which I had seen only one in Topslip. To date, I’ve spotted about 6 Tigers but almost every time it was only for a brief moment. So, I’ve never really had a chance to photograph one. Now, my eyes are tuned to look for leopards even though watching a Tiger to my hearts content is still a dream. 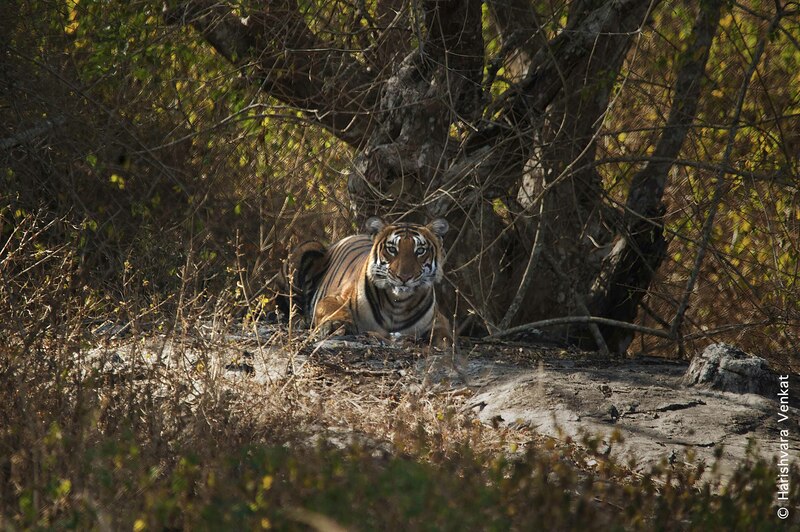 However, in June 2013, when we visited Kabini, I was in disbelief when our naturalist pointed out to a Tiger. It took all of us in the safari vehicle almost a minute or two to actually locate the Tiger. That’s how far away it was from us. It was a 20 minute sighting but only through a binocular or my 500mm lens. Even then it was merely bigger than a spot. I was fortunate enough to take a photo of the tiger just as an elephant was entering the scene. My day was done. I have an elephant and a tiger in the same frame, but again, I was really disappointed with the image quality. It was all grainy and I had to crop it really tight to get a good view of the animals. I thought to myself, “Not posting that one”!! However, I got lucky last month. I had my friend Shivangi visit me. We went to school together in Singapore. And, as usual when ever my friends visit me from where ever they are coming from, they want me to take them to the jungle. And I love it! 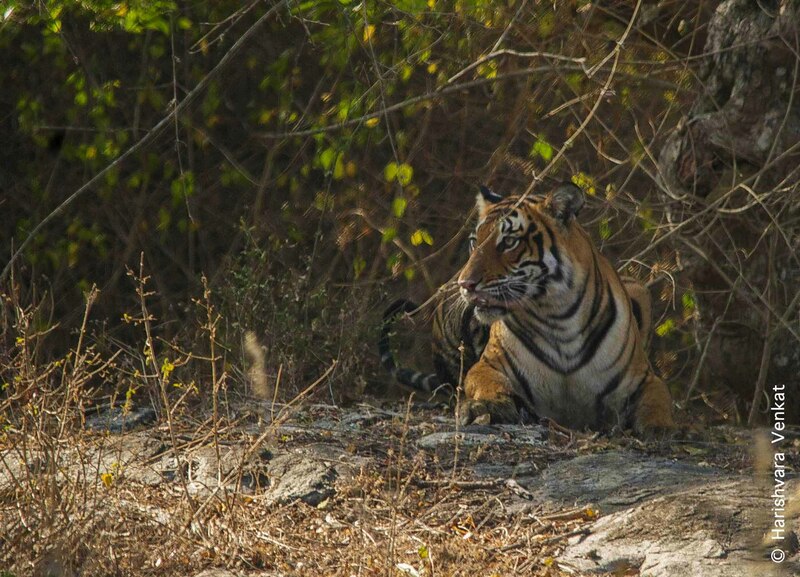 The whole experience of how we got to spot the Tiger itself was awesome. I am going to post an image, and explain along how it actually took place. As soon as we entered the park, we drove on the elevated road adjoining a huge waterhole (Just to give you an idea, the waterhole would have been about 10-15 medium sized sedan lengths). Upon reaching “Stop 1”, I heard the spotted deer alarm calls towards our left. I instructed the driver to stop for while to analyze the situation. Right now, the alarm calls are chaotic, it was as if the cat launched an attack, it was all haywire. Our driver then took a left and drove towards the temple where we heard the alarm calls from. Surprisingly, some deer there were absolutely normal doing their own thing. These deer rely on their ears, nose and eyes to watch out for a predator. Usually when they hear an alarm call, they must have seen or smelled a carnivore around them. Until the predator launches an attack, the deer have their eyes locked on to their animal of prey. It’s much more complex than how we see it. 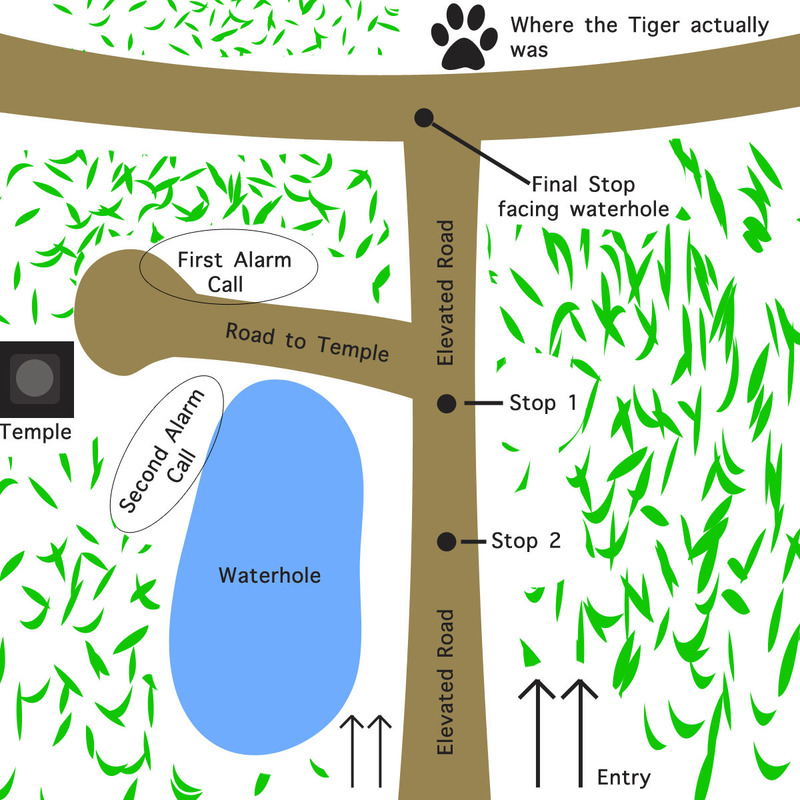 Since nothing much was happening there, we got back to our “Stop 1” only to hear the second set of alarm calls across the waterhole at “Second Alarm Call”. Immediately we backed the Gypsy to “Stop 2”. After a clean surveillance, we proceeded towards the “Final Stop Facing Waterhole”. Assuming the carnivore is going to emerge from the water hole and walk towards where we were parked, we reached the spot and were ready with our cameras. We waited for 10 minutes in silence, the deer had already settled down, it was absolutely quite. All hell broke lose when my friend heard something cracking behind us. Without wasting a second, I turned around to find a fine looking Tigress in her prime feeding on a Spotted Deer carcass. I got to spend 3 minutes with the Tigress, watching her eat and pick herself up to disappear into oblivion. Here are the photos from this series. Hope enjoyed the experience. 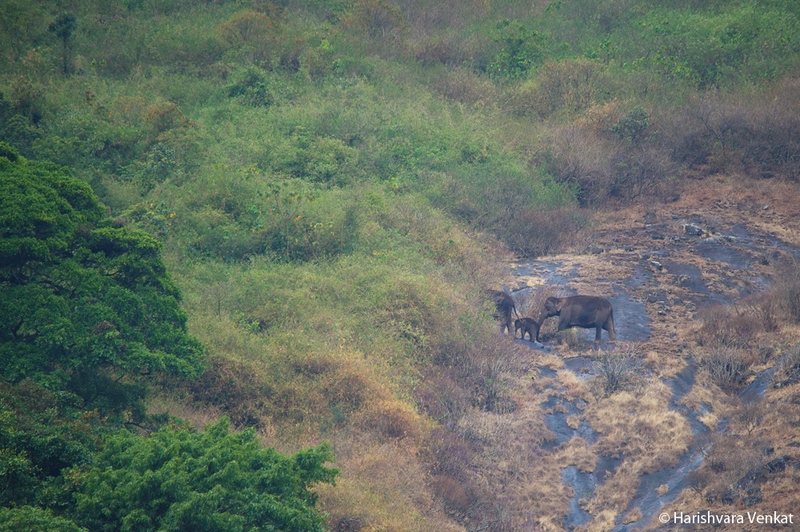 Kumki elephants are found every where today. When I mention the words “kumki elephant”, people sometimes have asked me if it was a sub species of the Indian Elephant found here, innocently so. 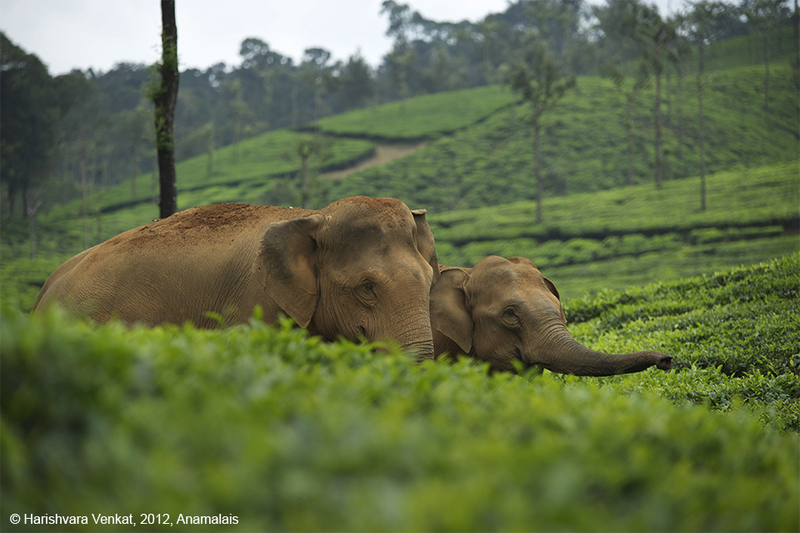 Kumki elephants are basically captive, trained elephants to keep the wild ones from foraging into human habitation. They are also used for breeding. However, the Kumki I mention here is not actually an elephant, although it is of the same color and is big, has four wheels and is in fact four wheel drive, it almost goes everywhere an elephant can, it almost feeds (milage) as much as an elephant, painted elephant grey and carries about 5 to 7 people comfortably just as an elephant does. What I am referring to here is a Mitsubishi Pajero christened by me as Kumki. After a long wait and a lot of thought, I decided to get myself an off-roader to suit my style of life. I am mostly found traveling to places where there are no roads virtually. The cars I had used earlier where sometimes damaged due to driving in such terrain and sometimes I have never reached the intended destination because of the road conditions. Even photographing birds was a challenge because they would just fly off if we get closer or the other sedan I have, couldn’t take me up close in cover. So, what I needed was a vehicle that can take me every where. After looking at Land Rover Defender 110’s, 90’s, Land Rover Discovery, Toyota Landcruiser 80 Series, 90 Series, 100 Series, 120 Series, Nissan Patrol Y60’s and Y61’s even the all wheel drive Subaru Forester, I couldn’t narrow down on one vehicle due to a lot of reasons. The most later models were too expensive to be thrashed, the cheaper SUVs were really really old to be a reliable vehicle. The last thing I want is to be stuck in the jungle with a broken down SUV. Dejected is how I felt every time I came back with no SUV to own. One final day, I decided to myself, lets try one last time and if nothing works out, I’ll be back to taking my Honda City to the jungle again. Got on to an online used car sales website and searched under the SUV column and I saw a Pajero listed on the top of the list. First off, I loved the color. I am not a big fan of the Dual-Tone Pajeros that they sell in India. The previous owner had painted this one dark grey and I loved it. 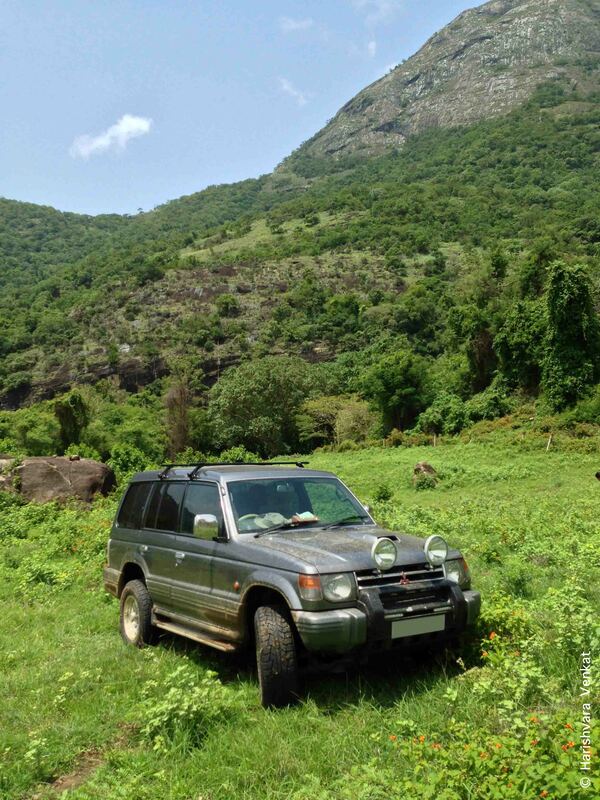 I contacted the owner Antony James and asked him about the vehicle and he said that it is parked in his family home in Trissur, which is about a 2 hour drive from Coimbatore. I asked him about the color of the vehicle again just to make sure if it wasn’t the crappy dual tone, he said “Elephant Grey”. As soon as he said “Elephant” grey, I decided in my mind that this one was for keeps and immediately named him Kumki. I’ve been having Kumki with me for a little over 6 months now and its just perfect. It saved all my other cars from being bruised and dented. Kumki at Anamalais foot hills. We have stocked this one up with a kit, what we call the Pajero Kit which has 4 Chairs, 1 Foldable Table fitted with 4 stools, a 4 man Quechua T4.1 B tent, Coleman Camp Rest, a 1 liter Fire Extinguisher (gifted to me by my childhood friend Prabu), Camo Umbrella, Micro-pore masks, Gloves, 2 sleeping bags, 3 tent lanterns, one pair of Motorola Wireless, Knives, Shovels, Rain Coat, Blankets, Portable Stove, Cooking fuel that lasts for 8 hours, Plates, Cups (paper, foldable and aluminum) Bear Grylls Ultimate Survival Kit, Thermos Flask, Serviettes, Universal Powerpoint Adaptor, Extra batteries (AA, AAA, 26650, 18650, CR123A) 9 led UltraFire flood light, Pepper Spray, Insect Repellent Spray, Toilet Seat cover, Toilet Seat Sanitizer spray, Disinfectant Tissues, Snake Bite Suction Kit, and loads of tea, coffee, sugar, salt, instant noodles, Garbage bags and finally a first aid kit and a full fledged medicine kit. 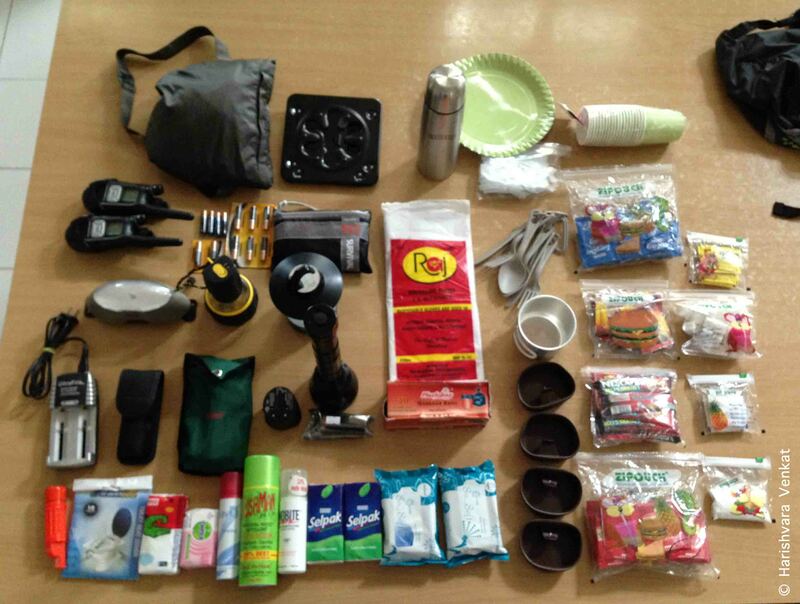 This kit goes everywhere Kumki goes. And we are finally equipped with whatever we would need on a rainy day. Meet Kumki the Mitsubishi Pajero. 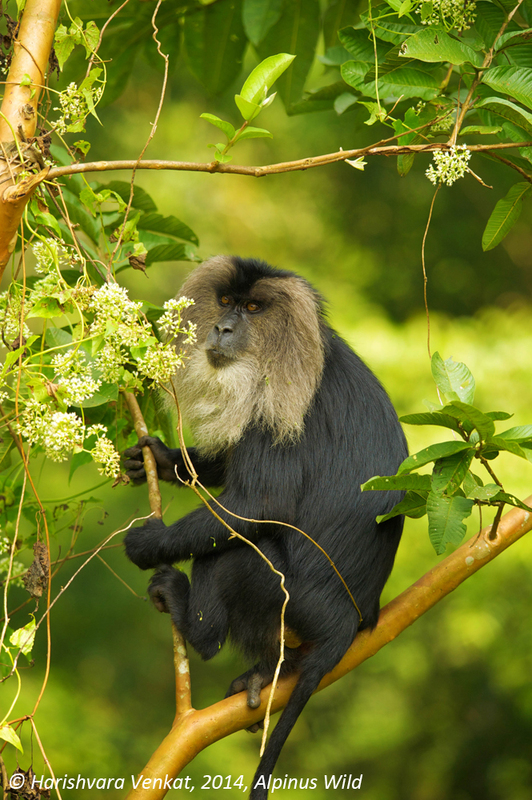 The Lion Tailed Macaque (Macaca silenus), one of the most endangered primates of the world, is endemic to the Western Ghats. Almost after three days of no show, I got a call from a friend of mine saying there is a troop of LTM behind the tea estate managers bungalow he works at. Without wasting time, I immediately hopped into my car and drove off to shoot these Old World Monkeys. 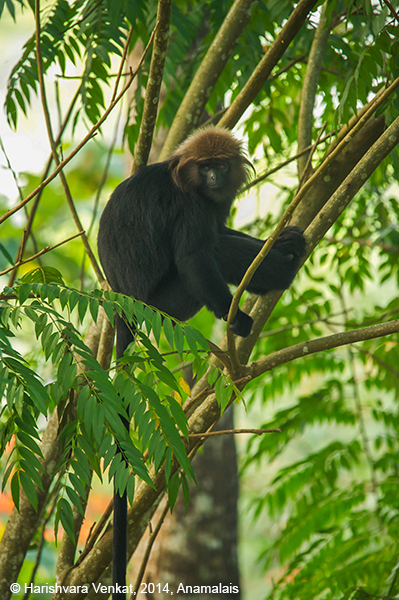 As soon as I reached the spot, my companion by the name Guru, ~ a local volleyball player who was famous among the young girls there~ walked me to the Lion Tailed Macaques. Unfortunately, the main troop had already left the place before we reached. However there was a lone monkey still loitering around. This particular animal seemed very alerted and restless. Moments before I made this photograph a leopard was sighted in the vicinity and it was evident in this Macaque’s behavior. It never stayed in one place for more than five to ten seconds. I already had a few images in my mind that I wanted to make, and because of sparse light it seemed like a flop show. But, after staying with the LTM for about an hour, I could clearly see a pattern that he adopted to safely move and monitor the area, both from the top of the tree and the ground, looking for the leopard. He climbs on the tree shown in the above photo, sits on it for a while, climbs down only to walk for a bit to the concrete post to get on the roof of the building and this continued. Moments before he took the last couple of leaps to jump on the concrete post, I made an image. Fortunately it wasn’t a flop show after all. Moments before he jumped on the concrete post. Finally, after a long time he climbed down to the ground, finds himself a rock to sit on. I was just a few meters away from him with my camera focus locked waiting for an action. He yawned, I was lethargic and missed the action. Mad at my self for missing the shot, I decided to hold the camera still and be alert until he moves. Equipped with the 9 fps of my Nikon D3s and my aching muscles holding the heavy camera for a while now, thinking to myself to never give up. Suddenly, I sensed a movement through my viewfinder and I went trigger happy without even realizing what he was doing. This time, it wasn’t a yawn. He was trying to get some debris off of his steel grey mane by pointing his head upwards and shaking it really fast. Bham! I managed to get some good shots of it. It almost seems like he is a faceless monkey. After an hour of restless behavior, finally after sensing that the Leopard had left the vicinity, he beat a hasty retreat into the jungle and eventually disappeared. 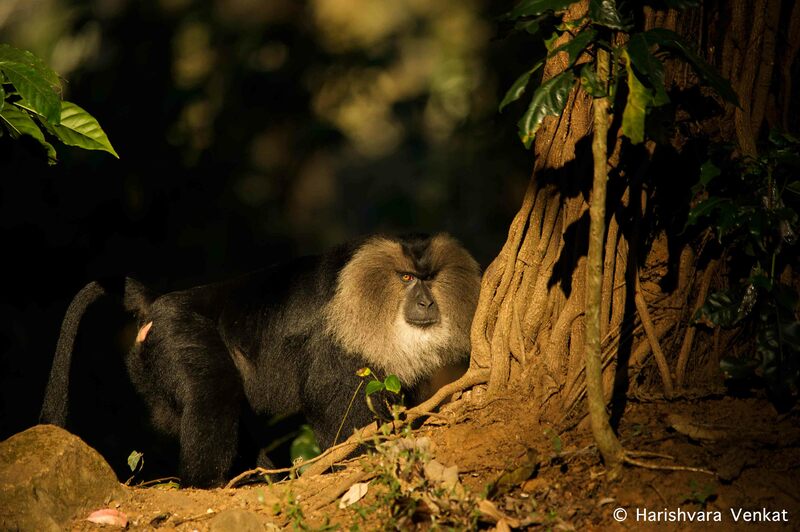 The last 3000-3500, as listed by IUCN, of these primates roam the rain forests of Western Ghats. Let’s Talk Program organized by Coimbatore Arts and Theatrical Society in association with Young Indians and Confederation of Indian Industry as a part of Coimbatore Vizha that happens every year, this year, the topic that was in discussion was Man-Animal Conflict. There were some distinguished people in the Panel Discussion, who have contributed a lot towards wildlife conservation, habitat restoration, creating awareness among people, sustainable conservation etc. Usually, people seldom relate to how vegetation can make a change in today’s Man-Animal Conflict scenario, and the impact it can create. 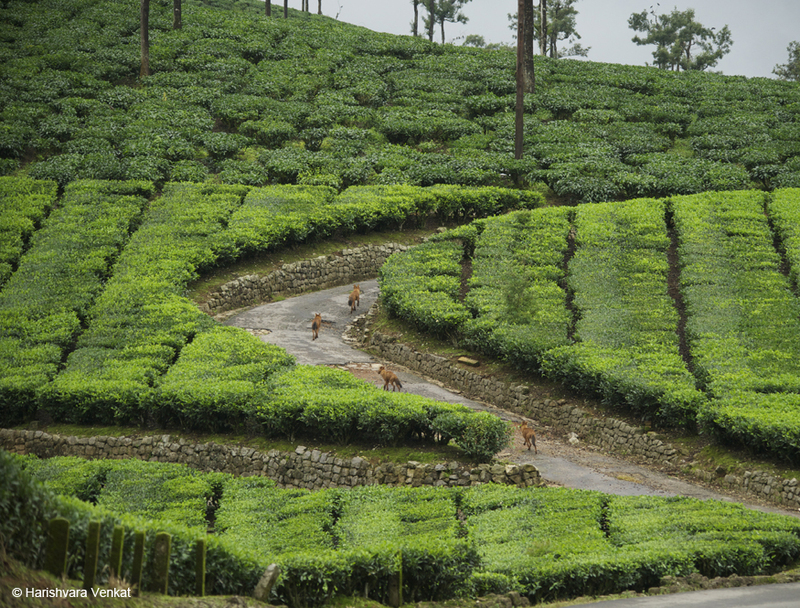 Mr. Arthur Steele, Director of Nilgiri Biosphere Nature Park, threw some light on this issue, saying how planting the right type of crop in the fringe areas can ward off wild animals from destroying the crop. Today, there are vast farmlands adjoining all forest reserves, invariably. This often invites wild animals to foray into the fields and raid the crops. Mr. Steele pointed out, planting the right type of cash crops and using fencing plants (eg. Lime Tree) is a more eco friendly way of keeping wild elephants and wild boars away from destroying the crop than using electric fences. He also mentions that not a single coffee plant in his Organic Coffee Estate in Kodaikanal had been broken in the last 20 odd years because of such adaptive measures. Dr. Manohar, The Chief Veterinarian of the Tamilnadu Forest Department, pointed out one of the major contributors to Man-Animal Conflict- Human Behaviour. He describes, how these animals in the sensitive area have learnt to deal with human beings who usually only taunt them and provoke them invariably all the time. He mentions, in some fringe areas, there have been reports of peaceful co-existence between humans and wild animals. Over a given period of time, animals change their behavior towards humans and how to deal with them, he adds. Dr. B. A. Daniel, Scientist/Entomologist and Secretary Trustee at Zoo Outreach Organization, points out how much educating the locals can bring about a change in todays Man-Animal Conflict scenario. Having held awareness programs in India, Bhutan, Nepal, Indonesia, Thailand, Dr. Daniel has proof for his education program working. Mr. K. V. Siddhartha of Coimbatore Arts and Theatrical Society put forward a very radical idea of introducing insurance policies for farmers who plant the right crop in their fields. 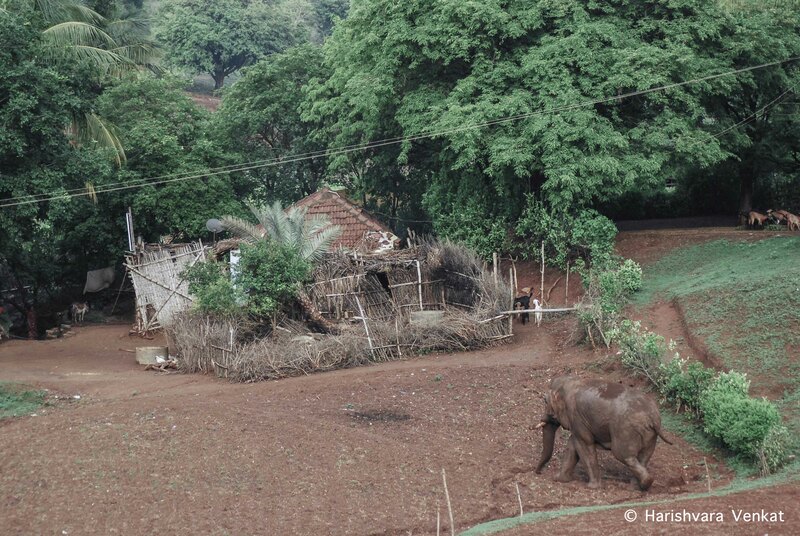 Wild Elephant walking towards village hut. 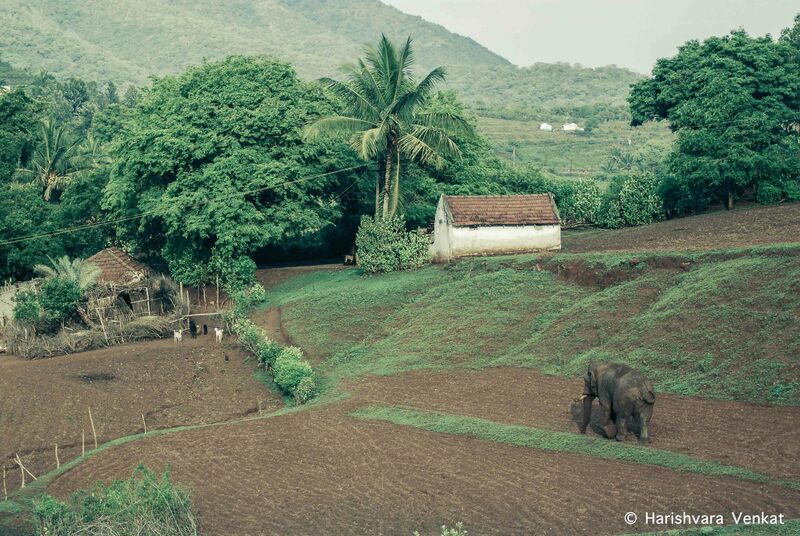 One of the many ways today’s farmers try to keep wild elephants away is by digging out Elephant Proof Trenches (EPT). But today, huge EPTs covering a massive piece of farmland, has the potential to alter ravines and small streams which in turn affects the water flow to reach its destination. Elephant getting dangerously close to human habitation. At the Let’s Talk Man-Animal Conflict program, we tried to throw in all our ideas, concerns, and possible solutions to reduce the rate of Man-Animal Conflict in and around Coimbatore and try to develop Coimbatore as one of the most sustainable bases for Wildlife Tourism. How far we succeed in imbibing these measures and containing Man-Animal Conflicts will be a matter of evaluation in the coming days. The event brought all the wildlife enthusiasts and conservationists together and it was a privilege for me (Harishvara Venkat) to moderate the discussions and share space with all of them. Finally, I have created a WordPress site for myself. Even though I briefly used to blog earlier, I have been inactive for a long time now. This site is created with the intention to write regularly about my main interests, which are, Wildlife, Wildlife Photography, Conservation, Automobiles, Formula 1, Traveling, Off-Roading and the likes. Looking forward!